Kitchen Status Day 1, Phase 1. Well, first things first, about 2 hours after yesterday’s post I considered deleting and halting the #kosher5779 experiment because — what was I thinking?! So, that’s where I am today, day 1. But after a deep breath, I realized I’m legitimately interested in what this process will be like. I’m curious about what I will learn and explore along the journey, but I’m also interested to see if I will exist differently in my kitchen and experience cooking, or myself, in a new way. I’m used to having other self-imposed constraints on my diet/cooking (like when I’m plant-based), but will this be different? I just don’t know and I’m curious enough to move forward (until my next “what am I thinking” moment). So what’s the kosher status of my kitchen right now? I don’t cook shellfish or pork at home. Not that I haven’t ever, but I don’t currently as of probably 8 years ago. I don’t cook or serve milk and meat together however we do use the same pans, utensils, plates, cutlery, etc to prepare and eat both milk and meat. We keep kosher for Passover, but don’t do a full chametz (bread, etc) clean out pre-passover. A few weeks ago I did a cursory google search and came up with this article on Chabad.org. While I don’t generally look to Chabad as my authority about anything, I jived with the first line in the article, “I’m beginning to consider keeping a kosher home, but the leap seems too daunting to do all at once.” The suggestion was to divide the task into 3 phases, the first of which is to only buy kosher meat and stop eating milk and meat together. I can deal with that as a start! We don’t eat that much meat as it is, but for the meat we do buy (and eat) and eat at home, 90% is from Grow & Behold (the other 10% of meat I buy from the Forest Hills Greenmarket or from Whole Foods). I choose Grow & Behold for many reasons and honestly, until now the least of all was that it was kosher! 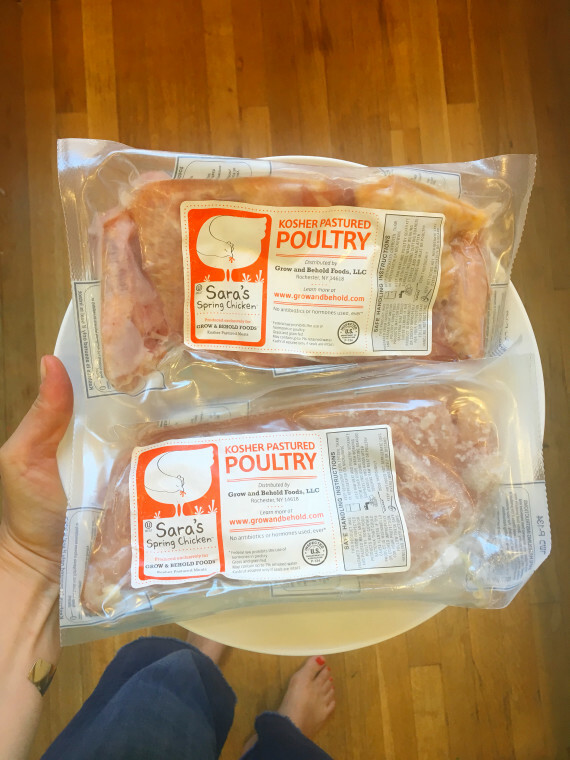 The meat and chicken happens to be delicious, it’s a small, local, family-run company (started by people I know), they sell pasture-raised, local, humane meat and they deliver right to my apartment (more about them here, and if you want 15% off your first order use this code). But, did I say it was delicious? Because it is, and this only buying kosher meat thing isn’t going to be hard at all with a freezer already stocked with Grow & Behold meat. And since I already don’t eat milk and meat together at home: voila, phase 1 complete! OK, I feel accomplished! Reminder, I’m going sloooooowwwww. So for today, I took out some G&B chicken to defrost in the fridge for shabbat and I’ll figure out what’s next later.